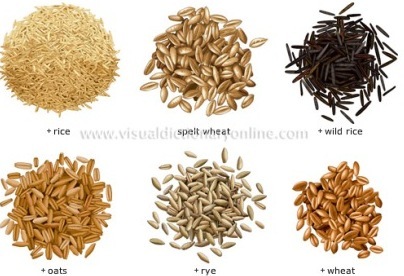 Cereals with gluten are: (oats), barley (germinated: beer and whiskey, too few gluten for bread: mix them if you want to use them in dough), rye (bread and whiskey), rivet, (ancient wheat variety, a long forgotten cereal that was rediscovered in a pyramid) and especially wheat (including durum (macaroni wheat) and common wheat (bread wheat). Wheat grain is the oldest and most suitable for bread. You can recognize the crop on the field roughly. Wheat spikes do not wear ’hair', rye grains all have equally long spines, and on barley the lower grains have longer wires than the upper. Because of the indigestible husk of barley for human consumption it should always be peeled. Hulled barley is called grits (groats). Previously, the barley was peeled at a hulling mill. Rye depletes the soil less and requires less manure than other grains. By cross-fertilization in rye the crop corrupts easily. Milk ripe rye has a milk white grain that shrinks too much when drying. Yellow ripe gives good, hearty meal. Death mature is too dry and hard. The sheaves (cut and tied bunches) dry a day or 8 in the country. Then they are stacked in the barn on drying racks to dry (approximately 1 m above the ground) for threshing later. They lie on the cart with the ears inwards, so that on the road will be lost no seeds. (Those are the little things that do it.) After the rye harvest there was the first two weeks of August still be sown turnip or other green fodder. The farmer craft is not so simple, and success depends on very many small yet important things. Gleaning is after mowing and harvesting, collecting the remaining straws with grain in a kind of pillow case on the abdomen. Elderly and children did so in the service of the Lord. The poor sometimes after permission from the farmer. During the war there was often a variant of the gleaning practiced with scissors, and before the harvest. For hard and soft wheat, a distinction is based on the hardness of the grain. For bread is usually "hard" wheat used with a lot of protein and gluten. This 'bread wheat' has less starch and gains less flour than a common wheat species, but has a higher gluten content. Extra or very hard wheat is called (durum-) or macaroni wheat. Because of our climate is mainly grown here 'soft' wheat, which is mainly used as animal feed and as a raw material for cakes and pastries. Also of other cereals (millet, rice, maize) or seeds (buckwheat, chestnuts, chickpeas), roots or tubers (potato, sago and tapioca) flour can be ground. A flail is a 1.5 m long, sturdy stem with a cap or eye. A leather strap or eel skin makes the connection with a round bat of 0.6 m. With this the spikes are beaten on the threshing floor. Rhythmically alternating, at a fixed cadence every one turn to turn, so that the grains are flying off the spikes. This is followed by winnowing to separate the wheat from the chaff. In ancient Greece was thrashed by an ox or donkey with a threshing sledge: pulling a weighted shelf (tribulum) with hundreds of shards and stones at the bottom (and on top a rider) on the stalks over the threshing floor back and forth. In Egypt was threshed by walking oxen and donkeys on the spikes. A winnower is a large, low basket with on one side a higher rising edge which is held against the abdomen. The grain harvest is thrown up in it so the wind can blow away the chaff (the pellet around the grain) and only the grain falls back into the basket. End of 1600 we learned - from China, where he was already in the 2nd century BC in use - also know the hand cranked winnower who did the same. 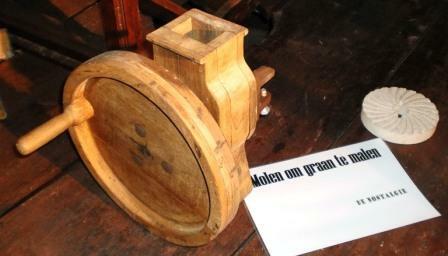 A paddle wheel: an axle with four wide shelves, and in between another 4, made as a fan the air supply. Through a narrow, broad funnel harvest fell for it. The chaff was blown away, and the seeds fell on a (shake) sieve (later driven by a camshaft) so weed seeds fell through there. 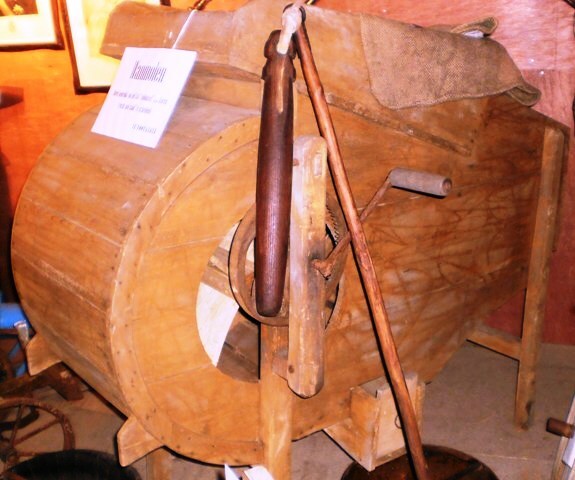 The big advantage of a mechanical hand cranked winnower was that there could be winnowed if there was no wind. Labor was cheap, it was not an issue. Separating oat from chaff was not so easy because it barely weighs more than the husk thereof. The husks of oats were used as stuffing for mattresses. And as a moisture absorbing mix added at (chopped) beet horse feed. Today winnowing is mechanically done in the same pass as harvesting with a combine harvester. Cereals containing gluten, but which do not cause celiac disease are: corn (oil, flour, cereals, alcohol, popcorn...), rice (subtropical, China .Cook Rice. ), teff (little used, very low profitable). Teff (Eragrostis tef) is a 160 cm long grass of which 150 grains weigh as much as a grain of wheat. They are lodging because the thin, heavily loaded stems hang down. Teff contains gluten but no harmful gluten fraction and is therefore well suited for people with celiac disease (gluten intolerance). sorghum or (African) broomcorn (Sorghum bicolor) also called durra, milo. Spelt (Triticum spelta), emmer and einkorn are precursors of wheat. Triticale or wheat rye originated from crossing wheat with rye. If you have few rows of plants, for example (3 or 4) as a (temporary) hedge, windbreak or boundary, you can put them closer together. You can also sow (nitrogen -supplying) clover or beans between. From other cereals the seeds are sown broadcasted. Corn can also be planted in a clover field. Buckwheat as a crop is sometimes erroneously counted for cereals. It's no grass and even a no monocot, but belongs to the knotweed family. Buckwheat is gluten free. It is also called beech (nuts)wheat: buck stands for beech, and wheat for grain. It is also written that it comes from the Russian, where the name would sound like buckwheat. The plant thrives also on lean and light (sandy) soil. It is a good binder for sausages and meat juices in scrapple. Buckwheat was preferably cut when the plant was damp, then they lost fewer seeds. So that was it early morning, or evening, or even overnight. Hemp also is not a cereal, but has nutritious seeds. Hemp bread was hot news in 2012 and became popular. Dutch Forensic Institute wanted to know whether the law on narcotics was violated. The bread was examined and no, you did not become high on it. The flour is made from seeds of plants which contain only traces of THC. And the amniotic membrane, which contains most of THC, it is buffed before grounding. The gluten-free bread is very nutritious, it contains a lot of high quality protein (50% more than whole wheat, or 20% if more refined). 6,500 years ago the stalk fibers were already used to make ropes, clothing, nets. To get an airy baking self-raising flour can be replaced by 2 teaspoons baking powder, 2 teaspoons baking soda, 1 teaspoon xanthan gum. The latter is caused by fermentation by a bacterium (Xanthomonas campestris) from sugar and molasses (syrup-like product in the production of sugar from cane or beet). We mainly use oats in muesli and porridge. Barley is a basic material for beer production. Corn is used for flour, oil (popcorn) and feed. Millet peeled in porridge and soup.